A standalone version can be used for testing a specific setup or version, without touching the system wide settings (profile). It can also be used to create a portable (USB install) of Vivaldi that you could store on an external disk, for sharing between computers. Since passwords and extensions are encrypted with a key which is unique to the user profile on each computer, they cannot be transferred. Vivaldi.com/blog/snapshots/ > to the (most recent) blog post to download the Snapshot. Open the installer from the Download panel or from the folder you downloaded it to. In the installation window select Advanced. Click Accept and Update to finish the installation. To open the browser go to the destination folder > Application > vivaldi. To access the browser easily save a shortcut to your desktop or pin it to the task bar. We recommend that you tick the additional dialogue box “Register standalone Vivaldi” (see above). This will make the standalone version appear in the Default apps list and will be added as an entry in the Registry of the operating system. If you have the Update notifier enabled in Settings > Updates, you’ll receive a notification when a newer version becomes available. To check for updates manually go to Help > Check for Updates > Install Update. You can also download the latest update from the website. Just save it to the same folder to keep the settings or create a new folder to have a clean install. 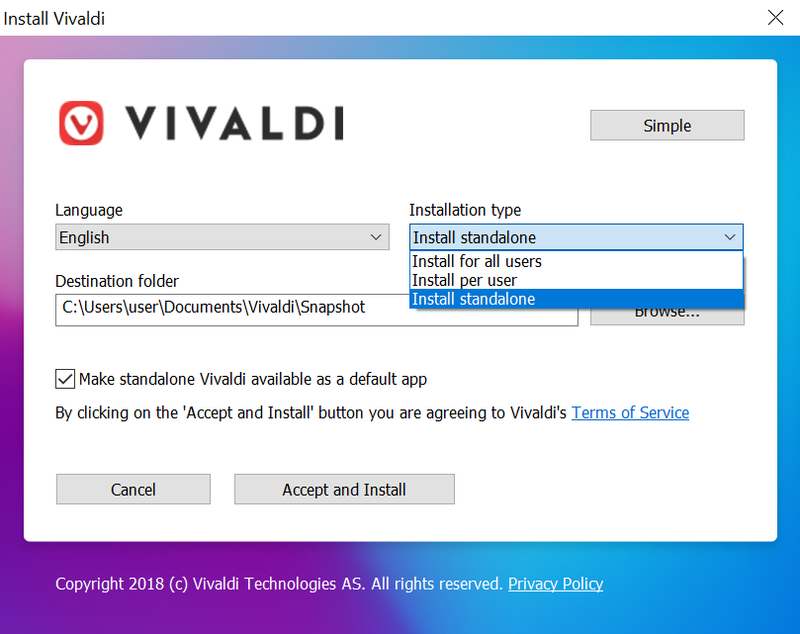 Go to the folder where you saved the Vivaldi standalone folder. If you can’t remember or can’t find it, go to Help > About and take note of the Executable Path. Delete the folder containing the Vivaldi standalone. If you are on Linux, you can run the Snapshot and Stable versions side by side. Running both versions on Mac is currently not possible.